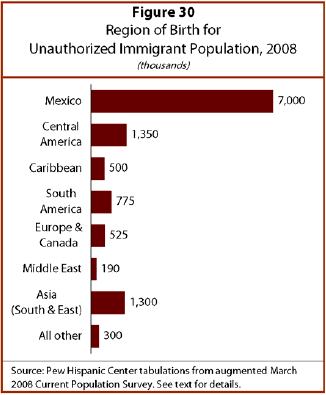 Mexico is the source of by far the largest number of unauthorized immigrants, accounting for 7 million of the 11.9 million unauthorized immigrants in 2008. This 59% share has remained roughly constant over the past three decades. Other parts of Latin America send a significant share of the total, with 1.3 million (11%) coming from Central America, 775,000 (7%) from South America, and 500,000 (4%) from the Caribbean. South and East Asia is another large source, sending 1.3 million (11%), whereas the Middle East accounts for 190,000, or less than 2%. Unauthorized Mexican immigrants are somewhat more concentrated than all unauthorized immigrants, accounting for high proportions of the unauthorized immigrant population in a few states. Thirteen states—a mix of traditional border destinations and new settlement areas, mainly in the West and Southwest—have high shares of Mexicans in the unauthorized immigrant population (73% or more). In three states (Arizona, New Mexico and Wyoming), Mexicans represent more than nine-in-ten unauthorized immigrants. The proportion of Mexicans in the unauthorized immigrant population shrinks in the northeastern quadrant of the country. Mexicans are substantially underrepresented (less than 43% of undocumented immigrants) in 20 states and the District of Columbia. The remaining 18 states with average representation of unauthorized immigrants tend to be the new-destination states in the Southeast and Plains. Mexican-born undocumented immigrants also are less educated and have lower incomes than other unauthorized immigrants. Among adults ages 25-64, only 4% hold a college degree, compared with 30% of all other unauthorized immigrants. In addition, 64% have not completed high school, compared with 25% of other unauthorized immigrants. The median household income for Mexican unauthorized immigrants was $32,000 in 2007, compared with $45,000 for all other unauthorized immigrants. This is explained in part by the jobs they hold, but also by the fact that only 50% of unauthorized immigrant women who were born in Mexico and are ages 18-64 are in the labor force, compared with 69% of all other women who are unauthorized immigrants. There is little difference in the labor force participation of working-age men from Mexico who are unauthorized immigrants (95%) compared with those from other countries (91%).